Spider-Man: Edge of Time is a video game developed by the Activision-owned developer Beenox, based on the superhero Spider-Man. The story, written by Peter David, involves both Peter Parker, the original Spider-Man, and Miguel O'Hara, aka Spider-Man 2099. Gameplay contains a "cause-and-effect" system in which one Spider-Man's actions will affect the other and vice versa. It was released on October 4, 2011 in North America and on October 14, 2011 in Europe. 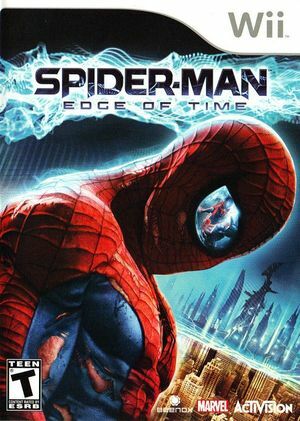 Edge of Time is the second Spider-Man title to be developed by Beenox, following Spider-Man: Shattered Dimensions of 2010, and the first released since Activision and Marvel's decision to make Beenox their lead developer on future Spider-Man games. The graph below charts the compatibility with Spider-Man: Edge of Time since Dolphin's 2.0 release, listing revisions only where a compatibility change occurred. This page was last edited on 16 January 2018, at 03:41.